How Long Do Bell Pepper Plants Take to Grow? Bell peppers grow in ascorbic acid soil, making them an acidic plant. Acidic levels in the soil determine the color of the bell peppers. 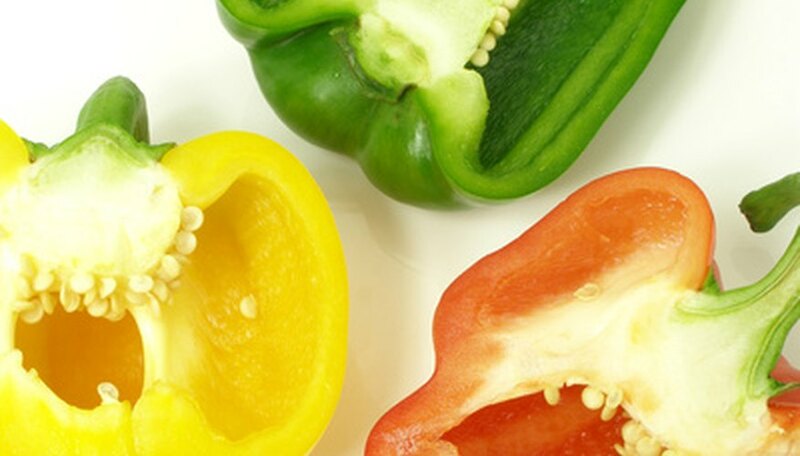 The lower concentration levels of ascorbic acid turn bell peppers a black, purple or white color, while higher concentration levels turn bell peppers green, yellow, red, brown or orange. Bell pepper plants take from 70 to 90 days to produce peppers, depending on the type of pepper planted. Leave a few bell peppers on the plant and allow them to become overripe. When the skin becomes slightly wrinkled, pull them from the plant. Cut the bottom off the bell pepper. Scoop the pepper seeds out from the inside of the pepper. You can do this with your fingers or by inserting a spoon and scraping them out. Place the seeds on a paper towel to dry for two to three hours and discard any large pieces of pepper flesh that may have come out of the pepper with the seeds. Put the seeds in a paper envelope, then store the envelope in a sealed container, such as a glass jar or plastic container. Place the seeds in a cool area where the temperature is between 32 and 42 degrees, such as a refrigerator. Pepper plants will bloom but drop their flowers if the daytime temperature exceeds 90 degrees and the nighttime temperature exceeds 75 degrees. They will also drop in the spring if it gets too cool for a long time. If leaves spot or have lesions and drop off, they could have one of three diseases, Alternaria leaf spot, Cercospora leaf spot and bacterial leaf spot. Use a copper fungicide mixed with chlorothalonil at the first sign of trouble. Tannish spots on the fruit are sunscald from exposure to direct sunlight when young. Remove the scalded fruit and move the plant to a shadier spot. Excessive water can cause plants to wilt and die. Be sure your plants are in a well-drained pot or bed. Wiggly trails on your peppers' leaves is caused by leaf miners. Treat them with diazinon or a recommended insecticide. If your leaves are yellow and have a mosaic pattern on them it is likely tobacco mosaic virus. Do not smoke around the plants or handle plants after smoking. Bell peppers can be harvested about 10 weeks after the plants are set outside. Seeds are planted indoors about eight weeks prior to planting, so in total they take about four months from seed to pepper.